The Cash-Landrum UFO case publicity made a splash in 1981, but had a second wave starting in 1983 after the filing of the lawsuit against the US Government for 20 million dollars in damages. The suit stuck to the details of original incident, avoiding later embellishments such as the legend of the scorched road being removed and replaced by men in unmarked trucks. 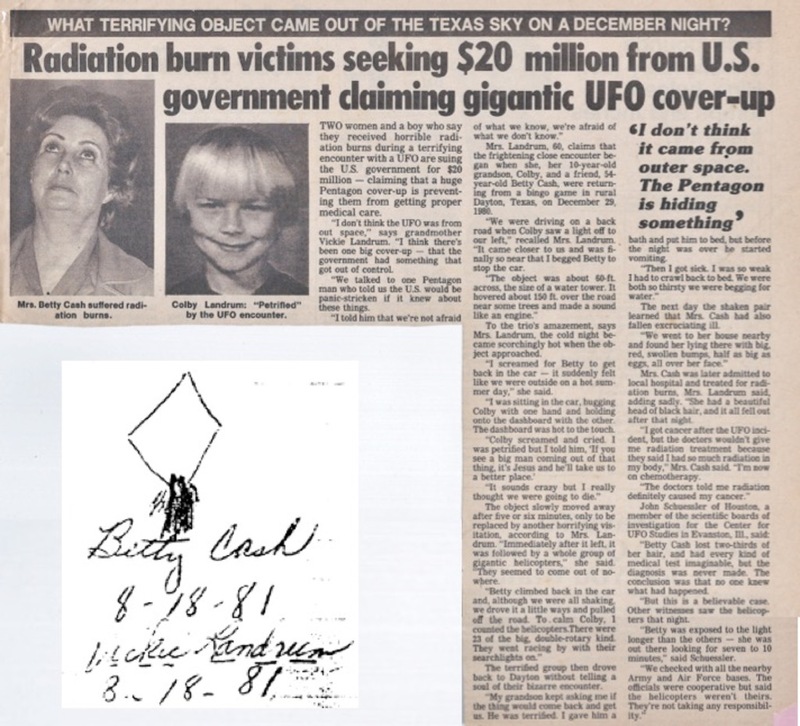 The article below on the Cash-Landrum lawsuit was sent to me by Martin Kottmeyer from his clippings of UFO stories from the 1984 period. It's typical of the coverage at the time and likely came from the tabloid National Examiner. It’s a good summary of the story, but has a few notable variations from canon. Quotations in newspapers, especially tabloids can’t be trusted for fidelity, but it’s interesting that Vickie refers to helicopter searchlights, something absent from earlier accounts. Betty Cash had breast cancer, but said, “The doctors told me radiation definitely caused my cancer.” The tests run during her original hospitalization were negative for radiation exposure. The other point of interest is Vickie’s reference to the “Pentagon man,” which eventually evolved into a veiled death threat: “He questioned me and I answered him, and then he told me that people had died for less than what I was trying to do.” Vickie Landrum from her appearence on “Sightings” TV episode, segment: “Physical Effects,” July 31, 1992. 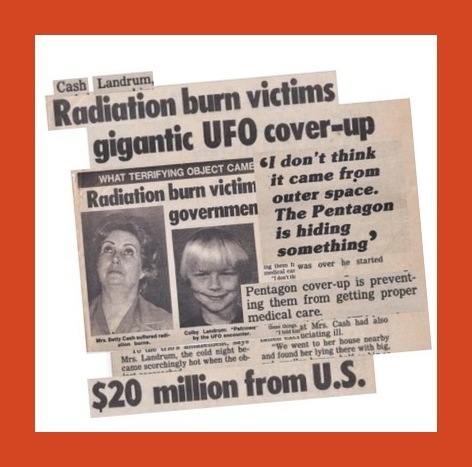 The Cash-Landrum case occurred at the same time lore surrounding Roswell was being developed, and distrust of the Government and the belief in a “Cosmic Watergate” UFO cover-up was central to them both. Without a villain to explain the lack of evidence, about all that is left are stories. Also pictured, UFO sketch by Betty Cash.